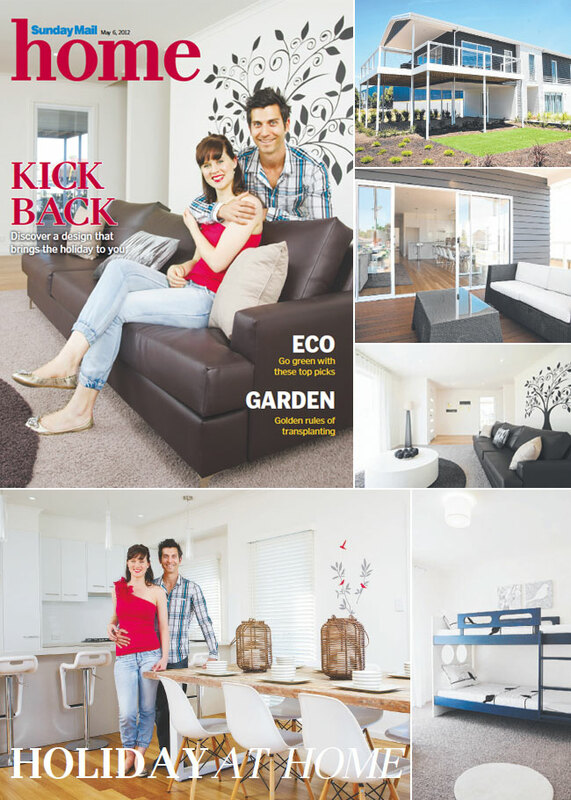 For more articles on the McCubbin 2 Storey please use the menu on the right. With four bedrooms and a balcony alfresco, the latest incarnation of the two-storey McCubbin appeals to large families and those who love to entertain. At 7.7m wide, it was originally designed for beach and riverside hot spots but has become popular for modern in-fill blocks. "More people are building these homes to live in permanently because it is so well suited for narrower blocks that are now common with urban development and land subdivisions," says Leanne Goddard, of Sarah Homes. "It has evolved out of the popular three bedroom design. The display is just over six metres wide and yet it is so spacious when you're inside, and is easy to customise to land orientation and lifestyle." Spaciousness is achieved with an open plan living scheme, complemented by light timber floorboards and 2.7m ceilings on the upper level. The lower level of the design has two minor bedrooms, one with a built-in-wardrobe. There is also a bathroom, laundry and living room. "If there are teenagers living in the house, they can almost have a floor to themselves and give mum and dad some peace," Leanne says. "The floorplan is functional in that it is zoned with different bedroom areas". Stairs lead to an open kitchen, dining and living area on the upper level. The kitchen includes overhead cupboards and a breakfast bar, providing another casual eating place. Large sliding glass doors at the side and rear fill the floor with light and extend the living area to a corner balcony deck, which is large enough for an outdoor lounge and table setting, ideal for entertaining guests. "It's just the most amazing home to take advantage of views, " Leanne says. "You can have balconies or decks on more than one aspect." "Here it's off the main living area and side but you can have the deck on the other side if that's where your view is." Off a small central hallway is a walk-in pantry providing ample storage space, while adjacent is the main, three-way bathroom. "The separation of the vanity, toilet and bathing area is very convenient if you've got guests in the house," Leanne says. Opposite this is another minor bedroom with built-in-wardrobe. The main bedroom is at the front of the design, and includes a double built-in wardrobe and an open ensuite, again enhancing a feeling of space. "Something that is becoming more popular is the need for car parking and this design allows for parking under the second storey in the form of a carport." For more information about the house in this story please look at the McCubbin 2 Storey Front Carport (4 Bed).